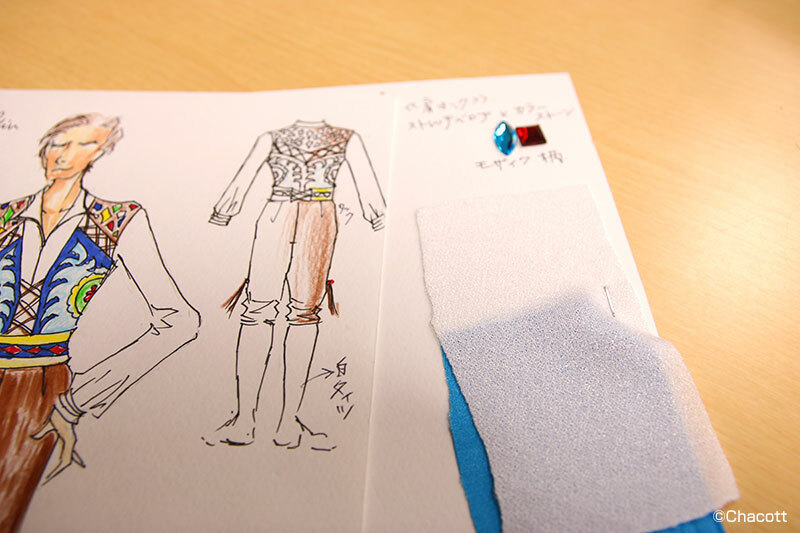 After skaters and staff alike took a bit of a break, this series is back to peek behind the scenes into the costume design process. As usual, Good Haro translated Chacott’s article. We’ve finally arrived at the short programs for the Grand Prix Final, and there’s only one episode left! Otabek Altin is the one of the six in the final making his first appearance on the rink. So without further ado, let’s talk about his costume. How did you approach this design? Ms. Yamamoto had asked me to design it after traditional Hungarian dress since he’d be skating to a classical Hungarian piece. The vest is made of a floral print fabric with stones affixed on top to give it some dimensionality and make it sparkle. The shoulder yolk and his pants would be made of stretch velour. Even the lacing on his pants is adorned with rhinestones. Can you tell us a little about the pattern on the vest? Sure. Large stones create a floral mosaic. I would have liked to use large beads, but sometimes, when I’d rather keep things a bit simpler from a finishing standpoint, I’ll use acrylic stone elements. What kind of material is the shirt made out of? It looks a bit shiny. It’s a satin knit. Given the look of the outfit, I opted to use the wrong side of the fabric to tone the shine down. When you use the wrong side of the fabric, it’s a bit less shiny and has a slightly rough texture. Oh, so you used the wrong side! Does the belt go on top at the end? The belt is actually part of the pants. In the anime it ended up being a plain, shiny material and it became part of the shirt. 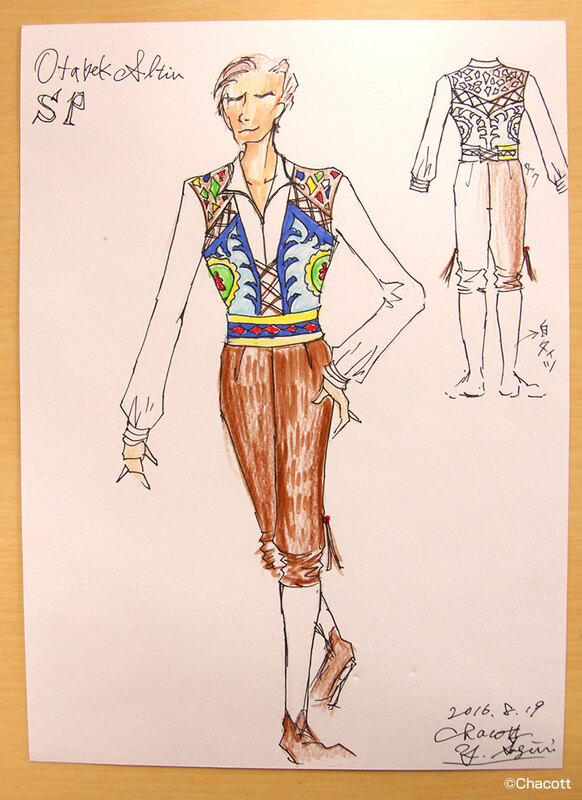 According to the design sheet, he’s wearing white tights, huh? I figured white tights would be appropriate with the traditional costume look… It’s a song with an extremely fast beat so the step sequences are a major focal point of the program. I thought tights would help ensure that the hem of his pants didn’t get in the way. They seem to have opted for boot covers in the anime though. And that’s it for this installment. 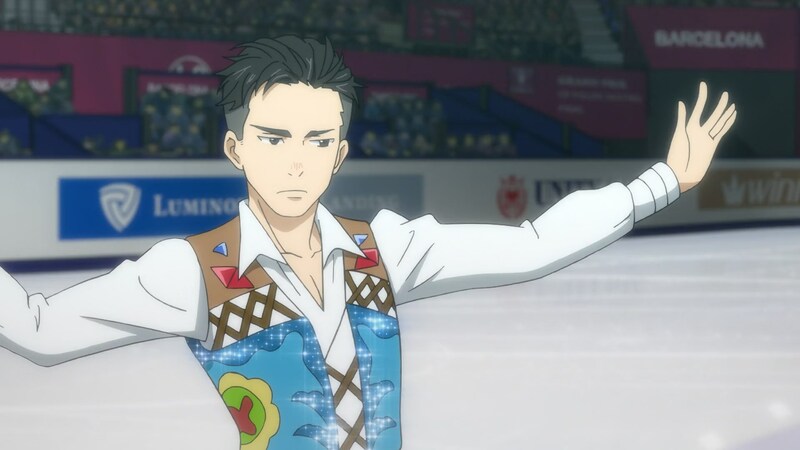 We hope you’re as excited as we are for the final episode and Otabek’s free skate costume! See you next time!